This spinach salad makes for a great starter or even a meal by itself. Instead of following tradition and using olive oil in the dressing, we opted for the fat rendered off the bacon to give the vinaigrette optimal flavor. To make cutting the bacon easier, chill it in the freezer for about 20 to 25 minutes until it firms up. Heat a large frying pan over medium heat. Add the bacon and cook, stirring occasionally, until browned and crispy, about 4 minutes. Remove the bacon to a paper-towel-lined plate and set aside. Discard all but 3 tablespoons of the fat. Place the pan with the remaining bacon fat over medium heat, add the shallot, and cook until fragrant, about 30 seconds. Whisk in the vinegar, brown sugar, and Dijon mustard; remove from heat and season with salt and pepper. 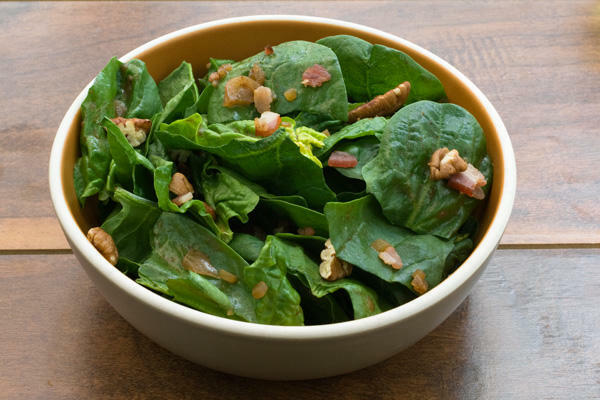 Combine the spinach, reserved bacon, and pecans in a large bowl. Add the vinaigrette and toss to coat. Season with additional salt and pepper and serve immediately.